A man waits at London Airport for Ingrid Ostermann, the love of his life, to arrive. Across the Atlantic, a retired NYPD cop waits in a bar in Florida's Key West for his first date with the lady who is, without question, his soulmate. The two men are about to discover they've been scammed out of almost every penny they have—and that neither woman exists. Meanwhile, a wealthy divorcée plunges, in suspicious circumstances, from an apartment block in Munich. In the same week, Detective Superintendent Roy Grace is called to investigate the suicide of a woman in Brighton, that is clearly not what it seems. As his investigations continue, a handsome Brighton motivational speaker comes forward. He'd discovered his identity is being used to scam 11 different women, online. Roy Grace realizes he is looking at the tip of an iceberg. A global empire built on clever, cruel internet scams and the murder of anyone who threatens to expose them. 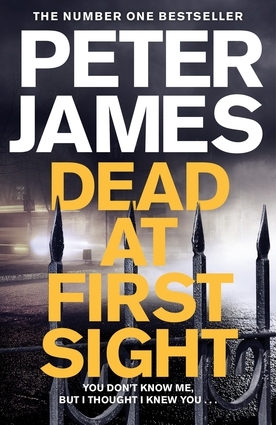 Peter James is a New York Times-bestselling writer of crime fiction. His novels, which include the bestselling Roy Grace series, have been translated into 36 languages, with worldwide sales of 19 million copies.